"With the 23rd overall pick, the San Jose Sharks select Ray Whitney from the Spokane Chiefs of the WHL"
That was over 20 years ago at 1991 NHL Entry Draft when the San Jose Sharks just joined the NHL and were participating in their first NHL draft. Whitney was the Sharks 2nd pick in the draft as they took Whitney's Spokane teammate Pat Falloon 2nd overall in the draft. Falloon was a bust and played parts of 9 NHL seasons and even though Whitney didn't last that long in San Jose, he has become a very consistent point getter in the NHL ever since. 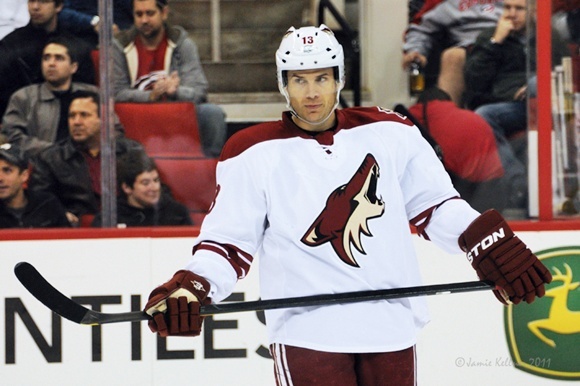 Whitney who will be turning 40 years old in May is still racking up the points in the NHL, playing now with his 7th NHL team in the Phoenix Coyotes. With his 19 goals and 58 points this year, Whitney leads the Coyotes in scoring and is a big part of why the 'Yotes lead the Pacific Divison and look to be heading to the playoffs. Whitney is on pace for 24 goals and 74 points this year - not bad at all for one of the oldest players in the league. Teemu Selanne gets a lot of love for still being able to put up points at his age and it's time Ray Whitney gets some props for still being able to produce in a young mans game. Whitney is just 16 points away from 1000 points in the NHL for his career, and if he maintains his 74 point pace, he'll hit 1000 this season and become the 79th player in NHL history to do so. If not, he is in his final year of a two year deal he signed with the Coyotes, but as the team's leading scorer you would have to think they would love to have him back next year. It will come down to if Whitney still has the love of the game and feels he can still compete, which he has proven this year. If you look back on Whitney's career you can see why he has slipped under the radar for most hockey fans. He has played on a lot of new franchises like San Jose, Florida, Columbus, Carolina and now Phoenix. Those places aren't the biggest hockey markets and don't really have any huge fan bases outside of their city, but Whitney seems to love an underdog as he himself is pretty underrated. Even in Fantasy Hockey circles he can be forgotten about. I was able to draft Whitney very late in a league with 15 teams and lots of roster spots last September. I have been rewarded big time this year with that pick. Whitney may not give you the most shots or PIMs, but for points he is a great late pick. Whitney's connection to the NHL began long before that 1991 NHL Entry Draft at the Aud in Buffalo when he was drafted to the expansion Sharks. Whitney and his brother Dean were stick boys for the Wayne Gretzky-era Edmonton Oilers. The third stick boy with the team was Captain Canada Ryan Smyth. Not a bad way to learn the game as he marches his NHL career from stickboy to the 1,000 point mark. Man that Carolina team was sweet up front. Whitney, Brind'Amour, Weight, Recchi, Staal, Williams, Cole, Stillman, Ladd.